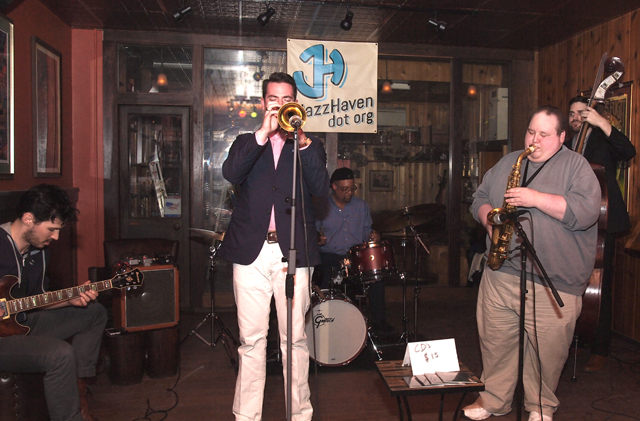 The Donald Edwards Quintet performs at the Side Door Cafe from 8:30 pm to 11:00 pm on Friday, April 5. Admission is $35.00. Since his emergence, Donald Edwards has played across the globe with some of the finest musicians in jazz. He is now building a reputation all his own. Donald Edwards has performed with jazz greats such as Freddie Hubbard, Tom Harrell, Donald Harrison, Jesse Davis, Greg Osby, Kurt Elling, Ralph Bowen, Branford Marsalis, Ellis Marsalis, Wessell Anderson, Orrin Evans, Joey Calderazzo, Wynton Marsalis, The Mingus Big Band, Dynasty & Orchestra, Charlie Hunter, Russell Malone, Conrad Herwig, Alvin Batiste, Stefon Harris, Seamus Blake, Dave Holland, Boris Kozlov, George Colligan and Mark Whitfield,. Edwards was born into a musical family. His father Dock is a classical pianist and his mother Geraldine, a voice major. Edwards began playing music at the age of eleven in Opelousas, Louisiana. He went on to study music at Southern University in Baton Rouge, Louisiana where the renowned teacher Alvin Batiste resides. He then continued in music eduction as an adjunct teacher at the University Of New Orleans. Edwards, now in New York, continues to give his time to help teach young aspiring percussionist in schools throughout the community. After winning the Louisiana Arts Ambassador’s Award in 1994 for Music Composition, Donald Edwards became one of the most sought after drummers on the New Orleans music scene. He came up playing different kinds of music ranging from marching band, hip-hop and pop to r&b, jazz, funk and gospel music. As a result, Edwards is now called on to play many different genres of music and meets them with creative interpretation and virtuosity. Donald Edwards is among the vanguard of players on the New York scene today. Edwards has three recordings as a leader -“In The Vernacular” (Leaning House Label), “Ducktones” (Zoot – T Label) and “Evelution Of An Influenced Mind”- (Criss Cross Label) and is also involved in the production of numerous recording projects. With skills steeped in and out of the rich and varied traditions of Louisiana, drummer and composer Donald Edwards is dedicated in his pursuit of creative improvisation, compositional development, and experimentation with rhythms through conversing in dialects of a universal language we call music.